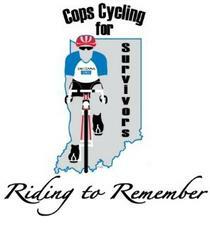 Monday, July 9, 2018, marks the start of the 17th annual Cops Cycling for Survivors bicycle ride around Indiana. A departure ceremony will be held at 8:30 a.m. EDT at the Police and Fire Fighters Memorial on the capital grounds in downtown Indianapolis. The cyclists will depart shortly after comments by Indiana’s U.S. Senator Joe Donnelly along with Sarah and Laura Barrett, survivors of fallen Indiana State Police Trooper Daniel Barrett. After the 9:00 a.m. departure from the memorial, the cyclists will head south to the Southport Police Department where they will meet with Lt. Aaron Allan’s family, friends, and co-workers to honor and remember his ultimate sacrifice for Hoosiers on July 20, 2017. Later in the ride the cyclists will visit the survivors of Sgt. Joseph Cox, Jr., Allen County Sheriff’s Department, whose end of watch was February 12, 2017. The cyclists’ journey will last 13 days and cover nearly 1,000 miles bicycling the perimeter of Indiana honoring fallen police officers and their families. The Cops Cycling for Survivors Foundation, Inc. annual bike ride consists of active and retired police officers, law enforcement survivors, law enforcement family members and friends of law enforcement riding their bicycles around the perimeter of Indiana to raise funds and awareness of the sacrifices made by Hoosier law enforcement families across Indiana. Funds raised from this event are used to perpetuate the memories of officers killed in the line-of-duty and to aid surviving family members and co-workers of officers killed in the line-of-duty. Previously raised funds have been directly donated to foundations, scholarships and camps that have been started in memory of fallen officers or by Indiana survivors in honor of their fallen heroes and to provide immediate financial assistance following a line of duty death. The ride is scheduled to conclude the afternoon of Saturday, July 21, 2018, at Crown Hill Cemetery, Heroes of Public Safety Section. The closing ceremony will begin at 2:00pm EDT. Survivors and family members of fallen hero Deputy Sarah Haylett-Jones, Monroe County Sheriff’s Department, end of watch October 19, 2008, will provide the closing message. All are welcome to attend. Indiana First Lady Janet Holcomb is scheduled to join the ride during the last day. To track the ride’s progress, stops, and activities, please like and follow the group on the Cops Cycling for Survivors Foundation Facebook page (https://www.facebook.com/Cops-Cycling-for-Survivors-195826717113332). For more information about the organization, donations, or this year’s ride, visit their website: http://www.copscycling4survivors.org/ , or contact Monica Zahasky, President of Cops Cycling for Survivors Foundation, Inc. at copscyclingforsurvivors@gmail.com.